Unearth the power and sacred charm of the Chinese dragon to earn your fortune. Combine symbols that include Koi Carp, fire breathing dragons and traditional lanterns with this East-Asian Chinese 5 reel casino slots on the internet. Master the art of submission and you could soon realise the importance of the hallowed free-spin. For the past two decades, NextGen Gaming has acquired a lot of knowledge on how to design innovative and creative new online slot games. They know how to deliver engaging entertainment products and have proven themselves very popular amongst their players with a large list of different themed games to choose from. The energetic development team provides always new gameplay experiences to their audience. NextGen Gaming is one of the leading developers in this market if you want to play top 10 slot games they have. 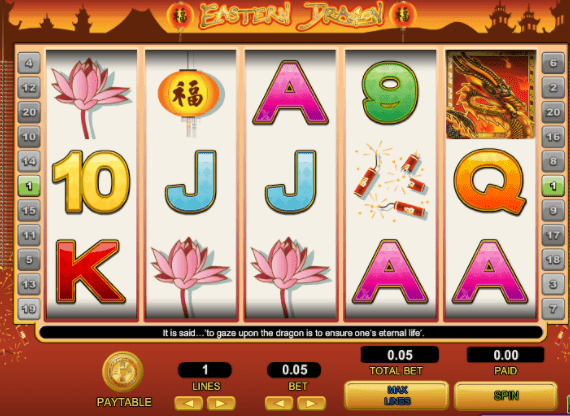 Eastern Dragon belongs to orientally themed online video slot games with lots of traditional Chinese symbols. It has a nice and simple 2D art and colourful reels. In the background, you will see the silhouette of a Chinese town with their iconic architectural buildings. Everything is set in a nice red-orange tone which leads to thinking that you are assisting a nice sun setting. The symbols you will find on the five reels and three rows are the classic A, Q, K, J and 10 written in a font that looks much alike with Chinese calligraphy. The remaining items on the reels form winning combinations with just two matching symbols. These are the shiny golden Ching coin, the pretty paper lantern, the gorgeous lotus flower, the thrilling firecrackers and the friendly koi carp. Look out for the dragon, they are considered a sign of good luck in China, and in this game, they actually are, as he represents the wild symbol. You will only find him on the reels one and five and when you manage to land the dragon on both reels in the same spin you will be awarded 15 free spins. During the free spins, all winnings are multiplied by 3. If you land a payline with a dragon wild the multiplier will go up to 6. You can also re-trigger this feature if you land the wild on reel one and five during a free spin. In Eastern Dragon you can find 25 different paylines filled with good luck and fortune, so why not try a spin? To start your game you have to bet a minimum of 20p or up to 40 pounds. And if you land a win in a spin you can also activate the gamble feature by clicking the “Gamble” button below the reels. Just guess the right colour or suit of the next drawn card and double or quadruple your wins. In this soothing video slot, you can find your fortune. 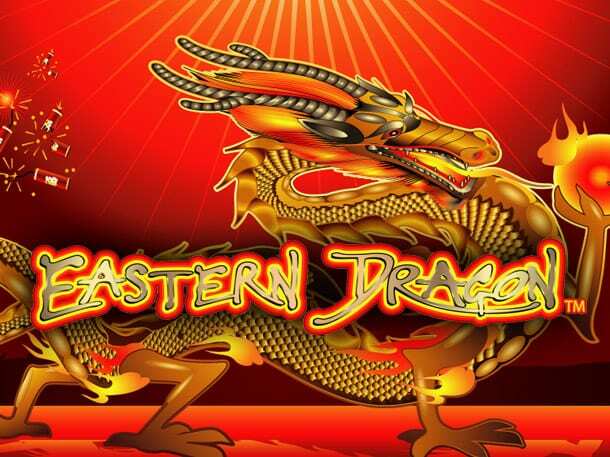 Eastern Dragon offers a relaxing gameplay experience with a nice free spins feature that can become very lucrative in a combination of a wild. The game is very simple and you will find yourself quickly immersed in the beautiful Chinese sunset. Easter Dragon provides a calming game feel filled with fortune and good luck, just like the dragons predict. For a change of scenery why not now try our call of the colosseum slot?